Gaming software for mobile phone is one of the most wanted and downloaded applications today, include Megapolis APK 3.10. This game is being popular as it is one of the strategy games played by a single user or player. This strategy game is so famous lately and it is said that Megapolis is mostly played in 20 different countries and downloaded by more than 10 million users. If you want to waste your time playing a game, it may be your right decision to kill your boredom. Besides, it has a good rating for about 4/5 stars in the official store of Android or Google Play. This game is actually quite easy and fun to play. You can build and manage your own city as if you are the founder or the owner of the city. However, you need to build a strong plan in order to make your city looks awesome and neat. Just like the other strategy games, Megapolis is usually guided by several tasks to do so you know what is going to be your next step in developing your city. The thing you need to know is that about the opening of the game. You can add the custom name for your city and type whatever words you like. Indeed, it has a great graphic design which sometimes requires you to have plenty of storage as it will load some data. In other words, you also need a strong connection because this game needs an online support to be played. That is why the weakness is when you have no great connection, you won’t be able to login to your account. Make sure you save every single progress you did to the tasks. 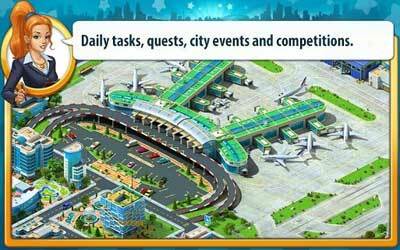 You can synchronize this Megapolis for Android with your Facebook or Google Play Games account. Now you can process resources in the Industrial Complex! Build plants and process resources into various products. Sell the products and make a profit! You can also complete orders at the Trade Port. Fill bulk freighters with resources and processing products and get building and production licenses! The stability and performance of the app have been improved.